Don't leave your fireplace hearth bare. Dress it up with a fabulous quality made Persian style hearth rug. Not just a thing of beauty, it also protects your floor with a fire resistant 100% virgin wool weave. 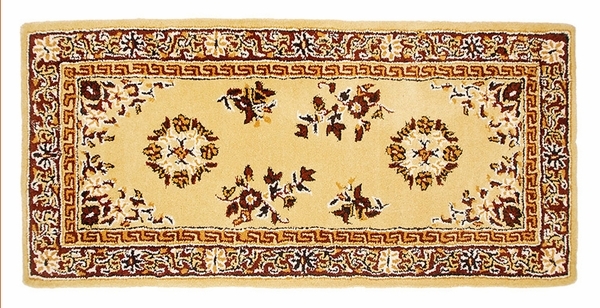 This beige rectangular size traditional Oriental style rug has five borders and floral medallion decoration. We also offer half round shapes and additional colors of blue and burgundy. These traditional hearth rugs will complement your traditional fireplace surround and add a touch of beauty to your living room. Don't forget the other rooms in your home - they can use a dose of color and comfort underfoot. What are the colors of this rug? This rug consists of multiple shades of gold and red. We ordered two hearth rugs from eFireplaceStore and were thrilled with the ease of ordering, the fast delivery, and most importantly the quality of the product. I would recommend this site to anyone looking for great service and excellent rugs. As anyone who burns a lot of wood fires can attest, a fireplace screen can't keep every stray spark from getting out of the fireplace, especially when you stoke the fire or put more wood on. As such, even with the best hearth rug you end up needing to replace it after a time. We went with this one because it was a little bigger, and it was much better than the selection near us.